I speak with surgical professionals on all levels on a regular basis. I'm talking about surgical professionals from students to seasoned surgical veterans, from potential students to ST's who are actively working on advancing their career. What, you may be asking is; "The Surgical Overload Factor!"..? Well, have you ever experienced a time during your pursuit of "the next step" when everything just seems to be too much to handle? 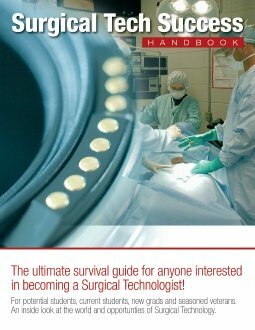 I mean, think about the process that is required to learn how to become a surgical tech. There are academic requirements, clinical requirements, study requirements, financial requirements, test requirements, and of course just taking that first step requirement. Then, once you've graduated and are looking for that first J.O.B., there's an application process, an interview process, an orientation process, and of course a resume & work history process. Then there is the inevitable "being the new guy" process when one is learning the different services, the surgeons preferences, and all about the "real world" surgical environment. OR how about the ST who has decided to become a first assistant, or RN, or PA, or any other position that requires an advanced learning process. There is the enrollment process all over again, the academic process, the tuition process, the study process, and the list can go on & on. All of these situations are definitely workable and you are more than capable of performing these requirements & processes IF you can keep the OVERLOAD FACTOR at bay. It's really very easy to get wrapped up in wanting to have everything completed NOW or wanting to just point, click, and presto...be done! The reality of all of this is such that we have to take one step at a time and go through the process in order to get to the next level. I see the OVERLOAD FACTOR on a daily basis. Yep, unfortunately the overwhelming feeling of wanting to have everything done at the click of a mouse kicks in and many people just go about doing what they were doing before without taking the time out to pause, digest everything, and simply take one step at a time while moving forward. Believe me, the overwhelming feeling of the surgical world and the overload factors involved in this career field can be, and are, at times, very difficult to deal with. I've seen the overload factor take control of new residents, new PA's, new orderlies, new sales reps, surgeons, and just about every other position you can think of in the O.R. There are times they have all struggled with the SURGICAL OVERLOAD FACTOR of learning & moving forward in the O.R. environment. If you are making moves or plans to advance your career or your current situation, you must recognize the overload factor and put the brakes on it immediately. Sometimes we simply have to take a step back or simply pause, take a deep breath, and remember to take one step at a time. Do not let yourself fall into paralysis by analysis. Don't let yourself suddenly become paralyzed like a deer in the headlights and freeze up on moving forward. If you're a potential student who has become overwhelmed by the requirements of advancing your education, pace yourself, and take one step at a time. If you're a new ST who has becoming overwhelmed by the demands of the O.R., pace yourself, and take one step at a time. If you're at a point where the next step just seems to be too involved and overwhelming, pace yourself, start with step one, and move forward. Imagine a person who decides to go to medical school. They are probably thinking about the big picture and looking at 4 years of pre-med, 4 years of med school, and then a residency. Now that sounds like a good plan, pretty straight forward, and "do-able". Trust me, I SPEAK FROM EXPERIENCE, as I too have let many opportunities pass me by at one point in my life or another because of the overload factor kicking in and stopping me from moving forward. If you look at the big picture and then prepare yourself one step at a time to complete that big picture, you'll be amazed how you'll continue to move forward and get to where you are meant to be. Everything in life is a process that can be worked through if you pace yourself with one step (sometimes even a baby step) at a time. You'd be surprised how something as simple as pausing, taking a nice slow deep breath, while making a single step forward, will propel you into areas that you might not even be aware of right now. You are meant for greatness and the pace at which everything is accomplished can only be pursued with one step at a time. Do not let the overload factor prevent you from being all that you can be.